Options for your own seven day tour of Scotland. Use this outline itinerary with great ideas and handy checklist on what to see and do. Discover where to eat and stay and how far you could travel with this starting point for your Scottish travel plans. This self-guided tour suggestion of Scotland in a week is just one of many possible itineraries you could do - and there are more route planning suggestions on this site, many linked from this page. The tour outlined in the page below is not definitive. Treat it more as a starting point for an idea of how much ground you could cover in a week in Scotland. If you want an organised tour of Scotland, we recommend Rabbie’s - they offer a wide variety of friendly small group tours all over Scotland, with departures from Edinburgh, Glasgow and Inverness. OK, so you have arrived in Edinburgh and find yourself, in the morning, blinking in the sunshine somewhere on Princes Street, wondering what to do first. See that castle on the skyline...? Now over to your guide. This most famous of Scottish castles has a complex history and today houses the Honours (Crown Jewels) of Scotland, the Stone of Scone (the crowning seat of the Scottish monarchy), St Margaret's Chapel (Edinburgh's oldest building), the Prisons of War, the famous 15th-century gun Mons Meg, the One o' Clock Gun and the National War Museum of Scotland. Edinburgh's Old Town features the atmospheric skyline of an ancient settlement running from the Castle to the Palace of Holyroodhouse. Alleys (known as closes) run like ribs off the backbone of the main through-route - the Royal Mile. It is pleasant to stroll downhill from the castle exploring the Royal Mile, with its shops, bars, restaurants and various visitor attractions such as The High Kirk of St Giles, The Museum of Edinburgh and Canongate Kirkyard. Scotland tour - for first-timers! Trip to Scotland - 7 days. East-bound from Edinburgh: East Lothian. They recall the days when the crowded tenements housed ordinary people and aristocrats all living close together in the same building. For some of the most interesting shops and a good choice of food and drink, explore the Grassmarket via Victoria Street. By the middle of the 18th century Edinburgh was still confined within its defensive wall and was very crowded with very high tenements - early skyscrapers! But it had a plan. The civic authorities announced a competition to plan a New Town. The winner was a young architect, James Craig, whose symmetrical plan had its axis on today's George Street - a street whose width was intended to be just wide enough for a coach and horses to do a U-turn! Today, George Street is one of the premier shopping streets in Scotland. Both the Old Town and the New Town of Edinburgh are Unesco World Heritage sites. Looking up at Edinburgh Castle from the Grassmarket. Edinburgh New Town, looking north to Fife. Linking Old Town and New today is The Mound, built from the foundations dug out to build the first New Town. At the foot of the Mound stand two important art galleries - the Royal Scottish Academy and the National Gallery of Scotland (this one is free). Another Edinburgh visitor option is The Royal Yacht Britannia, docked at Ocean Terminal in Leith (Edinburgh's historic port). This Clyde-built ship was the cruising home of the British royal family. The self-guided tour covers five of Britannia's decks, by way of the state apartments, the crew's quarters, and ending in the engine room. You can take afternoon tea on board too. HMY Britannia is deemed Scotland's top attraction. Find out why we think it’s over-rated and not worth a look. A glimpse of a fascinating world of privilege - or just a royal yawn? The Kitchin. Awarded its first Michelin star in 2007, Tom Kitchin is the youngest ever Scottish Chef proprietor to receive one. Amazing cooking, fantastic service. 78 Commercial Quay, Leith. Or search out Cafe St Honore - in the heart of the New Town and only 2 minutes walk from Princes Street - tucked away at 34 North West Thistle Street Lane. Delicious - with lots of lovely Scottish produce. The Grassmarket area is the heart of the Old Town. You have a great selection of pubs and restaurants and you are within walking distance of The Royal Mile and many Edinburgh attractions. Apex Grassmarket Hotel. Just nearby, also in the Grassmarket is the Apex City Hotel. The Ibis Royal Mile Hotel is also in a great central location in the Old Town. cityroomz on Shandwick Place at the West End of Princes Street in the New Town is simple and comfortable and very central. In the same location is The Caledonian Hotel, the famous five star landmark hotel of the West End - a former railway hotel built in 1903. If you want something in the same location that’s more contemporary - try the boutique hotel Angels Share Hotel in Hope Street. The Albyn Townhouse in Hartington Gardens is a super 4 star guest house in Marchmont, an attractive suburb only a few miles from the city centre - and on a regular bus route. Head north to Fife, and the small town of St Andrews - miles of golden sands, the oldest university in Scotland, a ruined castle as well as a ruined cathedral that was once a place of pilgrimage, and of course, the Home of Golf. St Andrews also gives non-golfing visitors plenty to see and do and is a fascinating medieval town to explore. The main shopping areas are around Market Street and South Street, with Bell Street and Church Street connecting the two principal streets. More St Andrews information here. The six golf courses at the Links, which include the Old Course, are open to all, as are the golf practice centre and the two clubhouses. The St Andrews Links Trust Golf Practice Centre (The new Golf Academy) offers state of the art golf technology. In this Fife excursion, you should try to visit the pretty villages of the East Neuk of Fife such as Anstruther, Crail and Pittenweem. There is also a small whisky distillery you can visit near St Andrews at Kingsbarns. Overnight: Ogstons on North Street in in the town centre. The Hotel du Vin is near the beach and the Old Course, but still central (it's a small town!) Need pampering and five-star luxury? - then book a room where the famous golfers stay - at The Old Course Hotel, Golf Resort and Spa. OK, it's the third day on the road. How's the luggage standing up to the travel? Hope you checked out some best-selling luggage on Amazon, even before you set out! We were rather taken with this anti-theft rucksack (though Scotland is a pretty safe place). It gets good reviews and was on offer last time we looked. A week-long tour of Scotland leaves plenty of time to enjoy our magnificent Highland scenery. After breakfast - head north to the Scottish Highlands (via Perth and main road north called the A9) visiting the little resort town of Pitlochry and nearby Edradour Distillery - the smallest whisky distillery in Scotland. Also take in Blair Castle, seat of the Dukes and Earls of Atholl, Scotland's most visited historic house. An extensive castle tour takes in some 30 rooms, including an impressive ballroom with 175 pairs of antlers, the China Room, displaying 1700 individual pieces, and an ornamental armoury which includes targes (Highlanders' shields) and muskets used at the Battle of Culloden. Nice gift shop here plus small cafe. Here’s a trip to Scotland, as an example. A seven-day Scottish itinerary taking in some of the best of our country. As well as the main destinations, we suggest a diversion - almost off the beaten track - to some lovely coastal scenery - but don't worry - you'll see Skye as well. Arguably the most popular tour in Scotland goes Edinburgh, Inverness, Loch Ness, Great Glen and Glencoe. Thousands of tourists can't be wrong, can they? No, it's just that this itinerary covers the most ground in the shortest possible time. It's a tourist conveyor belt that takes in some big names. Then continue north to Aviemore. Options around here include: The Cairngorm Reindeer Centre. See Scotland's only herd of reindeer. They are free ranging, but tame and friendly. The Rothiemurchus area has beautiful landscape, natural history and lots of activities - walk or cycle around marked paths, or enjoy fishing, pony trekking and mountain biking. Later, head north to Inverness - 'the Capital of the Highlands' - and overnight at Rocpool Reserve Hotel, an exclusive hideaway. Mid-range is the Glenmoriston Town House Hotel - on the banks of the River Ness and walkable to nice restaurants. An Grianan - Bed & Breakfast - offers a less expensive but very comfortable 4 star alternative. Pictured - heading out of the last pines of Rothiemurchus in autumn, with the path heading for the higher mountain tops. Chief of the Clan MacGillivray memorial at Culloden Battlefield. Today, visit Culloden Battlefield - 7 miles (11.5km) east of Inverness. No tour of Scotland is complete without a visit to the excellent visitor centre and exhibition and battlesite walk. The centre explains this historic site and the significance of the famous 1746 battle that accelerated the breakdown of the Highland clan system and the continuation of large-scale emigration from the Highlands. In the afternoon, take a boat trip on Loch Ness to Urquhart Castle with Jacobite Cruises. Then drive south down the Great Glen towards Fort William (the town at foot of Ben Nevis, highest mountain in Britain). Overnight: Combine history with 5 star luxury at Inverlochy Castle Hotel - simply one of Scotland's finest hotels. On a smaller budget? Consider The Lime Tree Hotel, Restaurant and Art Gallery or The Glentower Lower Observatory Guest House in Fort William. Try the freshest seafood at The Crannog Seafood Restaurant at Town Pier in Fort William - they even offer a cruise and lunch combo - a perfect holiday treat! Urquhart Castle - visit by car or combine with a boat trip. Which town, Oban or Fort William, makes the better base for exploring the West Highlands? Oban has a fine and breezy coastal setting but Fort William is nearer more rugged scenery. Helpful facts for itinerary planning for you to make your own choice - but we tend towards Oban. In the morning, continue on your tour by heading south on the main A82 through Glencoe - experience dramatic scenery here. Stop at the National Trust for Scotland's Glencoe Visitor Centre - to learn the history (about the infamous Massacre of Glencoe), geology and wildlife of this famous glen. There is a small cafe and gift shop at this centre. The Glencoe Folk Museum in the village of Glencoe is also interesting. Later, continue south via Rannoch Moor for Crianlarich and (pictured) Loch Lomond. For more information on the loch, follow that link. Later, continue south to Glasgow and overnight: Three stylish central hotels are Malmaison, Blythswood Square or Hotel Indigo. Also very central is the Z Hotel - we have stayed a few times - more quirky (as some rooms have no windows!) - but great value, friendly and clean (and your rate includes free cheese & wine in the evenings!). The best hotel in Glasgow's trendy west end (where you find more museums, the university and botanic gardens too) is One Devonshire Gardens. Loch Lomond from Firkin Point. A seven day tour of Scotland gives you time for the two largest cities in Scotland. Explore Glasgow - one of Europe's most vibrant city destinations. It is sometimes described as 'Britain's finest Victorian city'. But Victorian architectural exuberance sits comfortably with the Art Nouveau of Charles Rennie Mackintosh and the glass and steel of the contemporary city. Glasgow has more than twenty museums and galleries - many of them free - including the stunning Mackintosh House at the Hunterian Art Gallery, the Gallery of Modern Art and the outstanding Riverside Museum, Scotland's Museum of Transport and Travel. It was designed by Zaha Hadid Architects and won the European Museum of the Year Award in 2013. Glasgow is also one of the top shopping destinations in the UK. Typical high street malls such as the ultra modern Buchanan Galleries and the St Enoch Centre are close to the more exclusive Italian Centre and Princes Square as well as the boutique shops of the Merchant City. Glasgow's Gallery of Modern Art (GOMA). 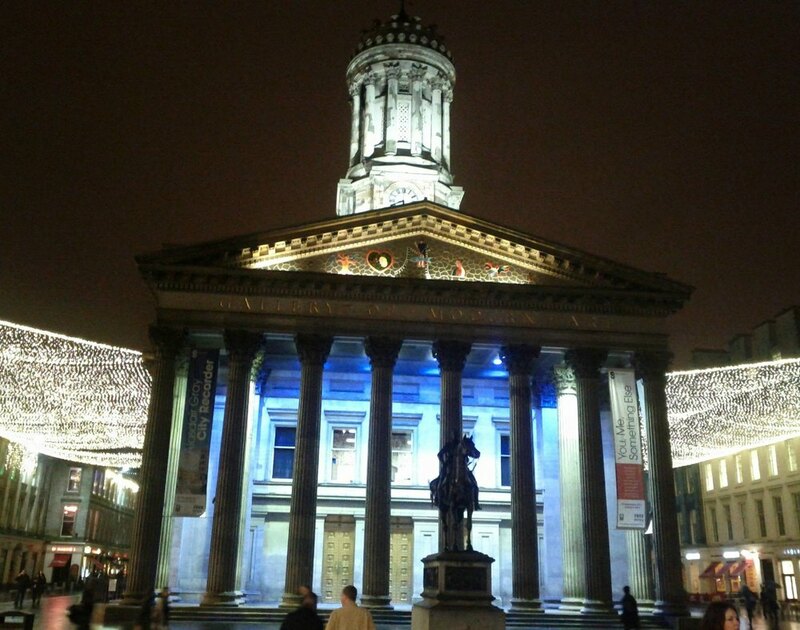 Gallery of Modern Art (GOMA) - GoMA is the second most visited contemporary art gallery outside London, offering a thought-provoking programme of temporary exhibitions and workshops. Buchanan Street - The Golden Z - the main shopping area of Glasgow consists of Sauchiehall Street, Buchanan Street and Argyle Street - also known as the "Style Mile" - it gives the city its impressive retail statistics. The Willow Tearooms - 217 Sauchiehall Street - Charles Rennie Mackintosh had control over every aspect of the design of this tearoom - not only the exterior but also the interior details, right down to the teaspoons and even the waitresses' dresses! The Willow name comes from its address in Sauchiehall Street, from old Scots, 'saughie haugh' - where sauchies are willows and a haugh is a low-lying ground. The willow theme recurs throughout the building. The Willow Tea Room also has another location in the city at Watt Brothers, 119-121 Sauchiehall Street. Here are some more ideas for afternoon tea in Glasgow and here are some more Glasgow must-sees. Continue south to Ayrshire and Burns Country to see the birthplace of Scotland's national poet. Burns Cottage was built in 1757 by Robert Burns' father, William Burnes. On January 25, 1759, Robert Burns was born here. It is now part of - and thereby close to - the interesting Robert Burns Birthplace Museum. Continue south to Culzean Castle (pronounced "Kull-ane") on its dramatic coastal clifftop site. Culzean is probably the finest Georgian castle in Scotland. A suite of rooms at the top of the castle was gifted to General, later President Eisenhower, for his use during his lifetime, by a grateful nation via the National Trust for Scotland. Overnight: The popular Savoy Park Hotel or Ayrs and Graces Luxury B&B in Ayr. The Edward Bonaventure, wrecked on the Moray Firth coast east of Kinnaird Head, Fraserburgh, caused a diplomatic incident with Scotland, England and Russia. Many valuables in the cargo disappeared and none have ever been found.